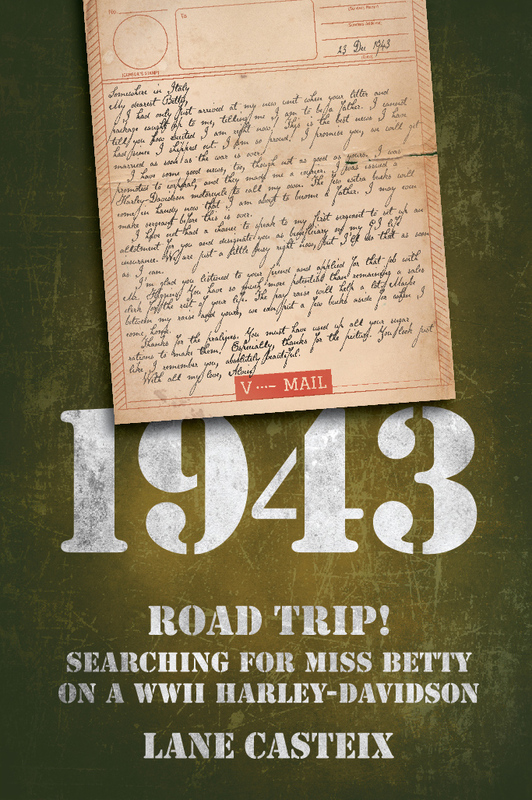 I am getting closer to publishing 1943. I was shooting for November, but it is looking more like December now. (I knew I shouldn’t have set a date…) Meanwhile, here is an excerpt to get you all excited about the book. Our hero, Mac, has been searching for the two people mentioned earlier in the book (see a sample of that here). In the saddlebags of the old Harley-Davidson WLA motorcycle, he had found a photo of Betty and a V-Mail letter written by her fiance, Alvin, in Italy during WWII. His friend, Buster has badgered him into looking for more information on the two. At this point, he has discovered a lot about Betty, but the missing piece of information about her is where she is today, and is she even still alive over 70 years later? From clues in the photo and letter, he has deduced she once lived in New Orleans, but that is as much as he has been able to figure out. To clear his head, he takes a ride on the old Harley on Rim of the World Drive in the San Bernardino Mountains in Southern California. (Been there and it is beautiful.) He stops and during the course of the stop, Mac has a conversation with his deceased wife, Jill—or at least that is what he thinks is happening. She seems to be speaking to him through her little dog, Pug. Here is the scene. Mac had always found riding a motorcycle therapeutic, and maybe it would work this time? If nothing else, a ride would allow him to get his mind off his failure to solve a case. Thirty minutes later, he and Pug were up on Rim of the World Drive and leaning into the curves and feeling the wind in his face. There, on the bike, he was in another world, one unencumbered with the cares of this world, but one that felt an awful lot like pure freedom. It’s not the destination, it’s the journey. But as he continued along, dragging the footboards in the tight turns and pushing the old Harley harder than he should in his attempt to forget—Betty came back to him. Giving into her, he pulled over on a lookout, the same place he had that long conversation with Jill only a few days before, and shut the bike down. With the kickstand down, he stepped off and away from the bike, pausing to look at it for a long moment. What had started out to be a fun project a few years before, that blasted bike and everything related to it had become a nagging obsession, one he could get no rest from. He loved it and hated it at the same time. He slipped the backpack off his back and let Pug out to run free. The little dog promptly relieved himself on a nearby guardrail post. Mac turned away from the Harley and stepped over the guardrail and sat on the rail under the shade of a scrub pine. He looked out at the vast expanse of southern California spread out before him in the valley below, staring out into the distance, looking but seeing nothing. Pug went under the guardrail and took a seat beside him. The two sat there quietly, each in his own world. “Then go find her,” she replied. He came to his feet. Pug jumped up and stepped away, his eyes focused on Mac. “Find her? How am I supposed to do that?” he said pacing and waving his hands in the air to give emphasis to his words. A car passed, and the two kids in the back saw him doing that. They looked at each other, and the older girl made circular motions with her index finger beside her temple. “You’re a detective, aren’t you?” Jill replied. “Jill, give me a break here. I have nothing to work with. I’m at a dead end,” he said as he continued his pacing and wild gesturing with his hands, once stopping to kick a rock over the edge of the lookout to express his frustration. “Go find her, Mac,” whispered the voice. While working on The Avenging Angel, I am also working on another book titled 1943. This one takes place in modern times and is thus a departure from the Catahoula Chronicles series. The story is about a retired San Bernardino Sheriff’s detective, Mac McConnell, who is struggling with the death of his beloved wife of 35 years. 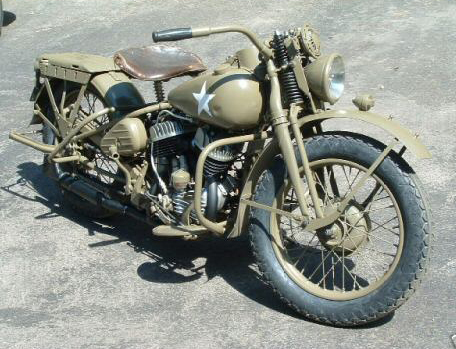 A short while before she was killed in an accident, she had encouraged him to purchase a “barn-find,” Harley-Davidson WLA Liberator, military motorcycle from WWII and restore it. With her death, he lost interest in the project, but his old codger of a friend did not and finished the restoration. The excerpt below is when Mac has been called by Buster (his friend) to come pick up the bike. After a brief ride on the restored antique, Mac is bitten by the riding bug again, and for a few minutes, is drawn out of his depressed state. Buster was friends with Mac and his wife for all of their married life and is using the bike to get the ponytailed, bearded, and withdrawn Mac to rejoin the human race again. While restoring the bike, Buster found something he hoped would do just that to the retired detective. The scene below is Buster laying out his “bait” for Mac. Mac did think about what it all might mean. He saw that they had a genuine piece of history in the Harley itself, but they also had historical documents associated with it. That was interesting. And Mac is drawn into solving a seventy-year-old mystery to discover what happened to Corporal Alvin and Miss Betty. Did Alvin come home and marry Betty, and they raised their child together? Is either still alive? What about their children? What Mac discovers about Alvin and Betty leads him on a cross-country road trip on the old Harley. Along the way, he meets some very strange and interesting people and ends up in some unusual, sometimes dangerous, and often humorous situations. In the end, Mac finds something he did not expect to find, his own future, the one he thought he did not have. I am shooting to get 1943 published by November 2016. Cherry Bounce Update – AT LAST!